Keyboardist Mark Andrews (Markham), drummer Bert Challenor and I all (previous members of the Clams) would get together on occasion, turn on a tape recorder and essentially make random noise. This was the birth of The Grackles. The name originated from a girlfriend's grandmother. She underwent brain surgery and emerged in a delusional world populated only by grackles (any of several north American blackbirds with iridescent plumage - Webster's) which she jabbered about continuously and in great detail. Thus, Cacklin' Granny Records. Markham took a couple so called "songs" we had recorded to some crazed old man with a record pressing machine and the first 45 was made. 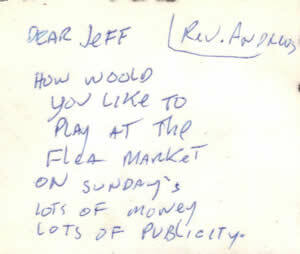 He then somehow got us in with KUNM radio and we started doing live shows. Mr. Shorey, also from the Clams, had gone into hiding in a town about thirty miles away, but the engineer would patch him into the studio via telephone. He would sit in his living room and rave while we attempted to provide a musical backdrop. We did several of these shows. However, the last one was a call-in format, in which the listening audience could call and talk to us. We'd planted some shills who would call in with incomprehensible music theory questions for which we already had the answers. These calls would be interspersed with taped "musical" interludes from previous shows to demonstrate the ludicrous answers. Unfortunately, someone called in who was extremely despondent and contemplating suicide. Markham tried to convince this kid that, yes indeed, suicide was his only option, and aggressively tried to encourage him to do it while we were on the air. It was an actual crisis call and we were never invited back to the station again. There were also some minor misunderstandings with the FCC regarding profanity. We made another tape or two, one being recorded in a railroad boxcar. Sometime later I was asked to come to a recording studio about 2:00 a.m. and Markham was there with some people I really didn't know. They quickly showed me the arrangement to four songs, one I had co-written some time back, and we immediately recorded them. This became the second 45. I don't remember the guitarist’s name, or that of the girl singer. Markham then went off with a road band called "James Blond" and I went off with another road band, both being booked by Ms. Bednar and her evil co-agent we called the Gimpy Gnome. After a particularly grueling tour of five states and 31 nights playing without a single day off, I went to the Air Force recruiter, became a navigator, and flew B-52's for Ronald Reagan for a number of years. 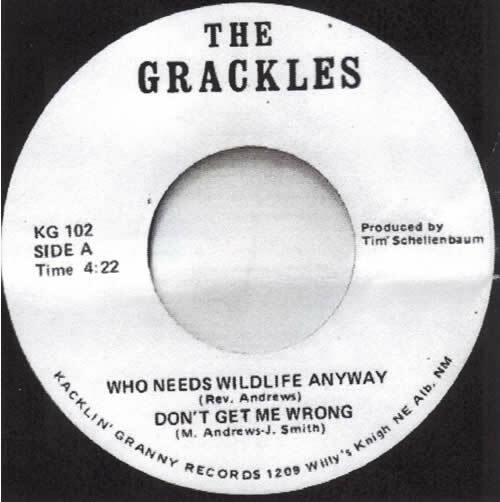 Once, when we were doing an airborne exercise in which air defense controllers were trying to vector fighters in on us, I put Grackle music out over the radio for communications jamming. Worked pretty well. In 1986 I received the Cosmic Sassy Grackles tape in the mail but I'm not sure who was on it. One time when I was home on leave I met Markham and Bert in a room filled with synthesizers and we made another tape. 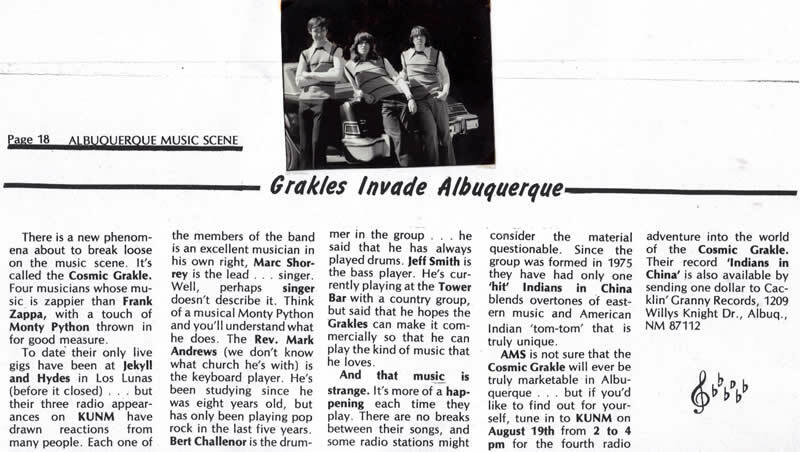 After getting out of the service; being gone eight years; and being in town only twenty four hours; Markham and Bert tracked me down and advised me that the Grackles were the opening act at a show at the Kimo theatre downtown the next night. I approached this with some trepidation, knowing that we never had any real songs, really hadn't seen each other in many years, and we certainly didn't have any songs in common now. However, I agreed to play. In those days computers were not commonplace, but Bert had cleverly programmed all of his drum sounds into a little keyboard, and ran it into a Pignose amp with about a two-inch speaker. The sound guys put a big mike in front of it and ran it into a huge stack of amps. 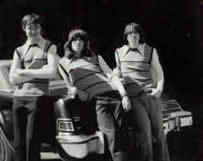 Markham had a keyboard, an open tuned electric guitar, and two stacks of Marshalls behind him. There were a couple hundred paying customers seated at show-time. Bert became paralyzed with fear and refused to go on stage. He sat in a folding chair with his tiny keyboard behind the back curtain. Markham, however, seemed totally unconcerned about either the restless audience, or the fact that he knew absolutely nothing about electric guitars as he struck his first distorted power chord. Three or four people in the front row went down from the initial shock wave, and things progressively deteriorated from there. Markham continued to coach agonizing feedback from the guitar and periodically beat on his keyboard, while panic stricken Bert frantically pushed buttons on his computer keyboard behind the curtain. I quickly grasped the only way to survive this situation was to put up such a sonic barrier that no one could possibly get close enough to pull the plugs which would have left us at the progressively enraged audience's mercy. After about 45 minutes of non-stop horrific noise bedlam, I found an opening, grabbed my gear and escaped out the back stage door. I heard sounds of a struggle from inside, did not look back, and made no attempt to perform in Albuquerque again for many years. I did a solo album in the early 1990' s. My last gig was last summer at a Czechoslovakian wedding in which all of the attendees wound up in a drunken, slobbering, spastic stupor, unable to speak or see. The Grackles could have played there and no one would have known the difference.